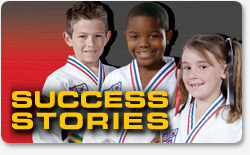 Welcome to Chief Master Babin’s ATA Martial Arts & Karate for Kids. We’ve been building strong bodies and clear minds in Mesa, Arizona for over 30 years. If you’re 3 years old, 43 years old or 73 years old, we have a martial arts class for you! If you’re looking for improved discipline, stronger confidence, personal safety, or health and fitness, we have a Mesa karate class for you. If you’re looking for just one class, or an introduction, or a black belt program, we have a class for you. While exploring www.billbabin.com, you’ll learn all about our programs, seminars, and services; you’ll read the success stories of those who have trained with us; and you’ll even find an easy, inexpensive way to get started. Welcome!